if you've trained for a long distance run before, you know the importance of sticking to a training schedule. One would laugh if they saw my scheduled training on the outlook calendar with all the races I have between now and February. 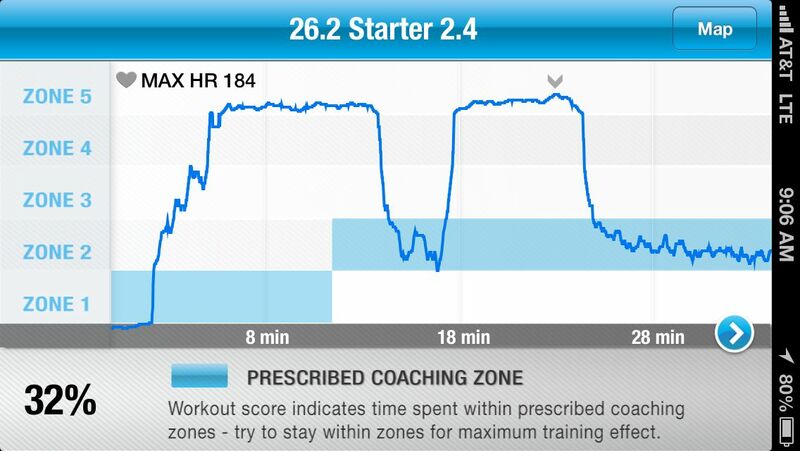 While I am pretty good about sticking to a schedule, I never paid attention to heart rate or speed work. I was very excited to be given the opportunity to try out the Pear mobile device through my relationship with FitFluential. I've been familiar with the Pear product for nearly a year now, after signing up for Rock n Roll Marathon Series, St. Pete and New Orleans. Pear is a mobile heart rate monitor that works with an app for iPhone 4s and iPhone 5. You strap the heart rate around your chest and it communicates by bluetooth to your virtual coach on whichever workout plan you select, from running to spinning and strength training. It has smart training systems that coach you in real-time, creating the ultimate workout experience, inspiring you to reach your goals. 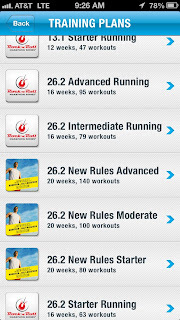 Pear is partnered up with the Rock n Roll marathon series so I was very happy to try out the Rock n Roll 26.2 starter plan. Although I am already 2 months into marathon training for New York, I jumped right in and learned so many new techniques and tips in the matter of two weeks. Check out all the options I had for 26.2! The RNR plan is taught by best-selling fitness author and running coach, Matt Fitzgerald. The first time I used the pear, I didn't have my heart rate monitor on correctly so the coach couldn't read my heart rate. I wear mine under my workout clothes and you cannot see that I have it on once covered with clothing. 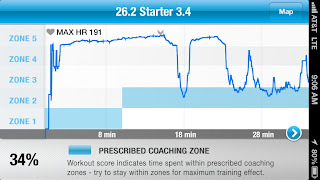 My very first run with Pear reading my heart rate didn't go so well. 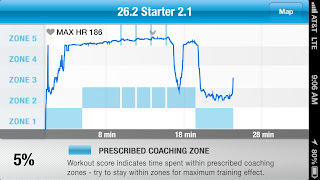 I was told quite often that I was above zone 2 and learned very quick that I do not run in the correct heart rate for training. It's no wonder I get over heated and dizzy. 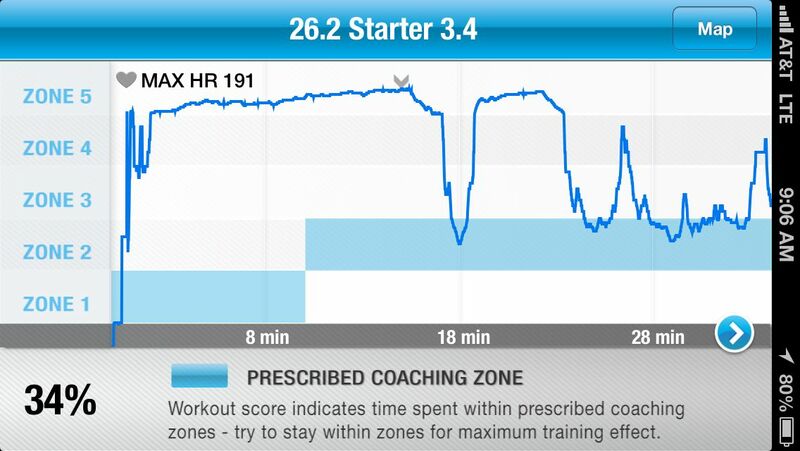 The zone I was supposed to be in is shaded blue and the dark blue line is my heart rate. 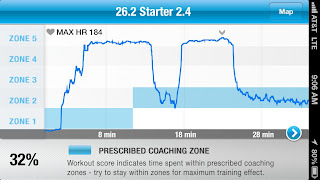 The second time I ran with the pear was a shorter run, 25 minute intervals which took me from zone 2 to zone 5. 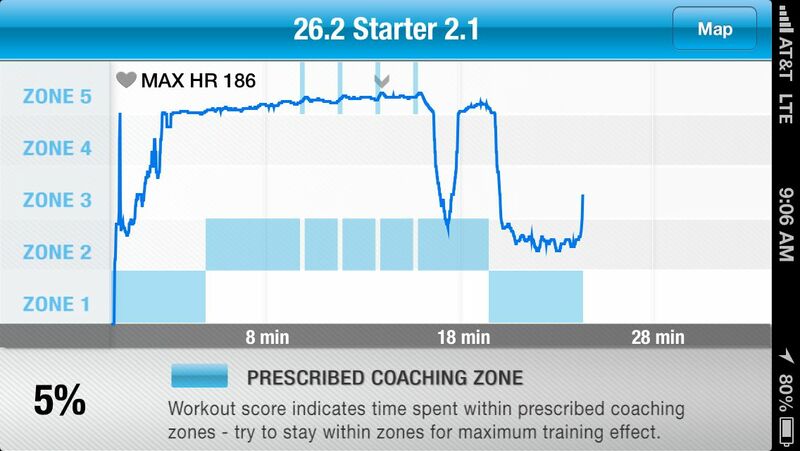 It was impossible to get my heart rate down after pushing myself to the max. I used Pear was for a 5 mile run yesterday. I was in Orlando for a quick family trip and my weather app said it was 102 degrees but felt like 169. I know that is not possible, but it was 102. When I got back from the 5 miles, my 3 year old niece took one look at my deep red face, asked what happened to me and then instructed me to go wash my face and put lotion on (sunblock). 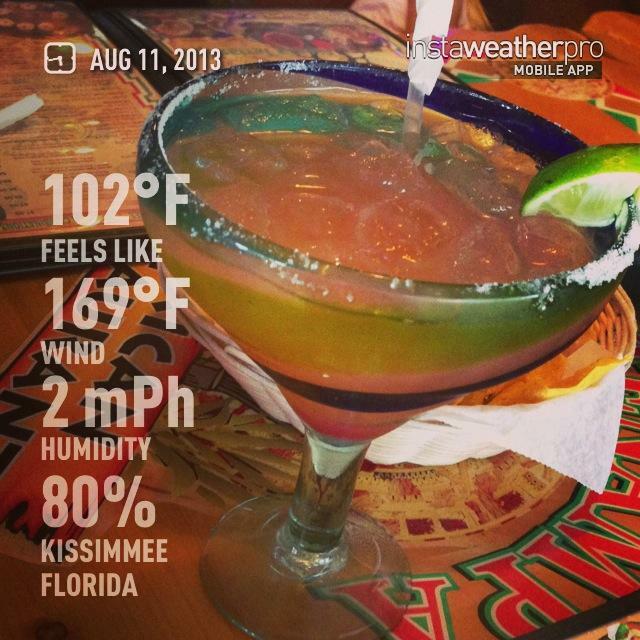 I do recognize that the heat is impacting my heart rate and my speed. It's the double edge sword of training in the south - it's miserable but you will be so much stronger for runs in the fall / winter. 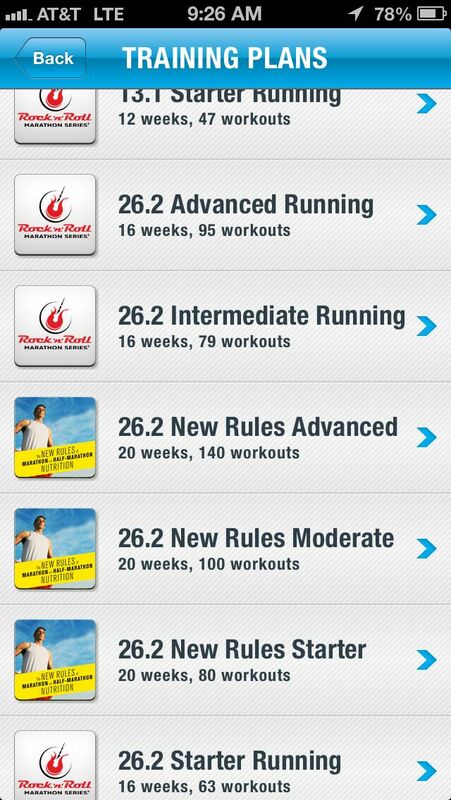 Along with the 26.2 starter plan, I also received Bodyweight burn 1, a workout that can be done anywhere, anytime. The second workout is Tread N Shed, a workout that is done with a treadmill and dumbbells. These workouts use the HIIT protocol and are geared for intermediate to advanced fitness levels. I haven't had an opportunity to check either of those plans out yet but will report back as soon as I have done so. After reading about both, I feel they will be great bridal bootcamp workouts! So tell me, #WhatPushesYou to work hard in the gym or to reach your next goal? Pear Sports is offering 30% OFF for the month of August with the discount code FitFluential! What are you waiting for? Click here to get started today! I received this product for promotional review but all opinions are my own. Wow. This thing is pretty damn nifty!! Although I think I'd start screaming "shut up!!" to it if it was telling me that I wasn't in the right zone. Funny what your little cousin said to you too...lol. I also look pretty scary after a run..